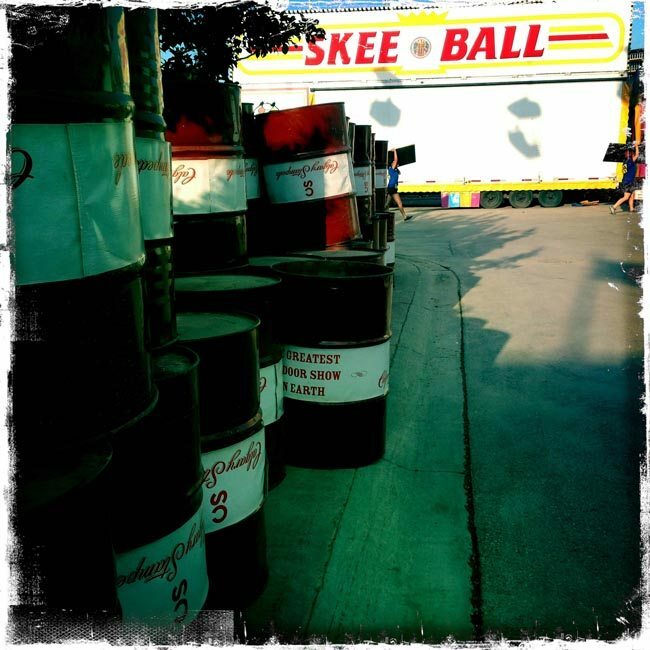 Sheila Schaetzle is wild about nature. It’s evident in her art: in how she paints radiant autumn leaves in a distant valley, in the way she creates light on a snowy path. 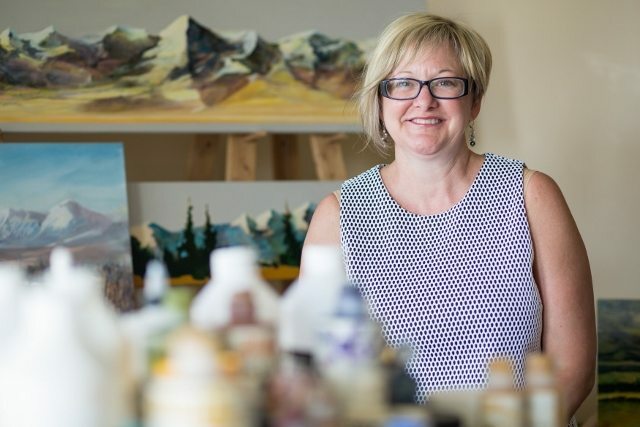 This Calgary-based artist uses her Maritime roots and Alberta home for artistic inspiration, both of which will be seen in the six paintings she’ll have on display at the 2015 Calgary Stampede’s Western Art Showcase. 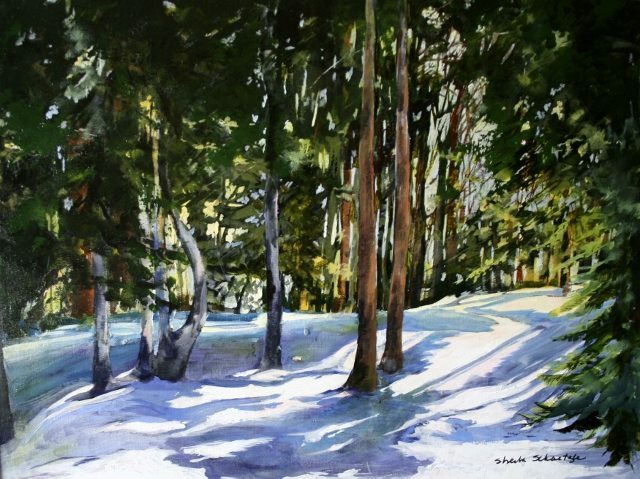 “Early Snow” will be on display at the 2015 Western Art Gallery. Her love for art began at a young age, filling sketchbooks as a child and studying art throughout school. 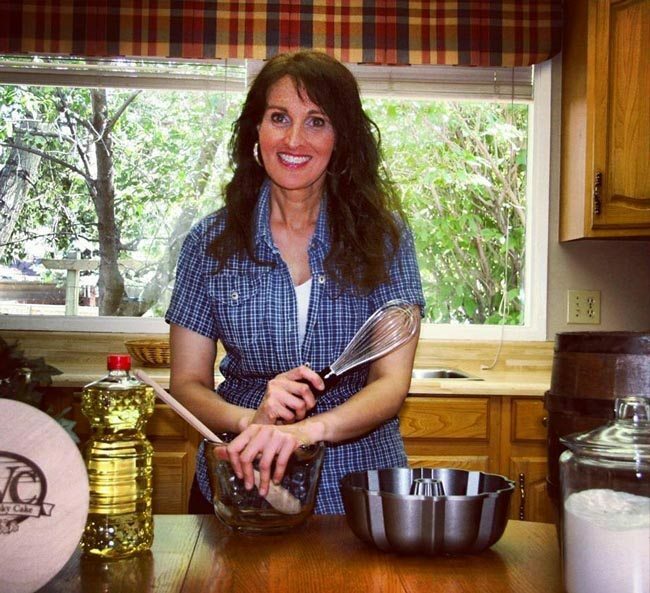 She decided to pursue art more seriously in 1998 with night classes, as well as learning from books and experimentation. Schaetzle works with oils, acrylics and mixed media, and loves exploring different techniques. Her goal is to create a “painterly” view, “something that’s not necessarily what you’re going to see in a photograph, but something that’s more original and on the creative side,” she explains. 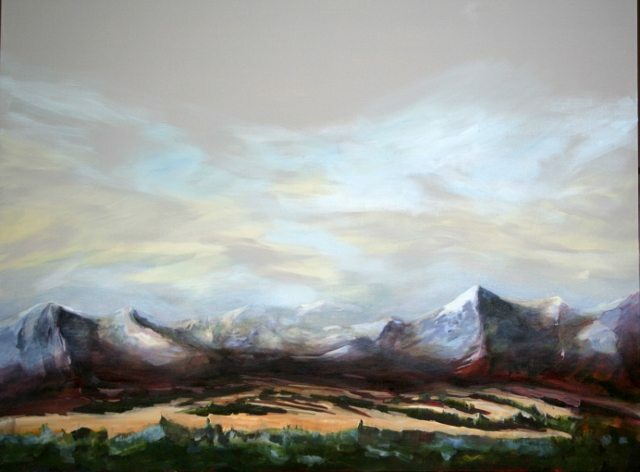 “Rocky Mountain Sketch II” was exhibited at the 2014 Western Art Gallery. She describes her process as “freeing,” and often works from sketches rather than photos. “Even in the sketching stage I’m working out a lot of what needs to happen, eventually, when I get the paint on the paint brush. So I journal about the thoughts and ideas that I have about what I want to achieve,” she explains. These are broad ideas on the feeling she wants to convey. “Often it’s based on something that I’ve seen or experienced, or a memory that I’m working from … I believe in painting what you know.” This way, each painting tells a story connected to the place or experience it depicts. “It’s a Beautiful Day” will be on display at the 2015 Western Art Gallery. 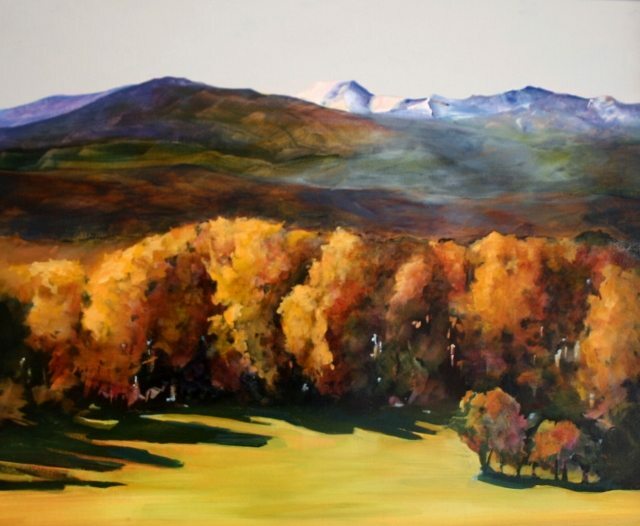 “Million Dollar View,” a new painting that is part of Schaetzle’s Rocky Mountain Series exhibited at the 2014 Western Art Gallery. 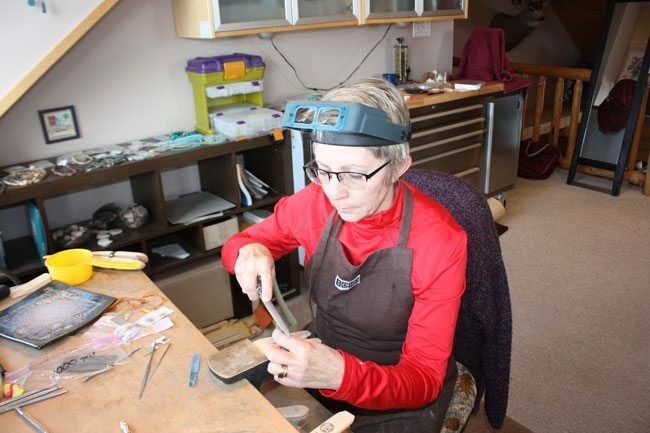 When she’s not at work in her studio, Schaetzle gives weekly art classes at the Calgary School of Art, and volunteers in her local arts community. 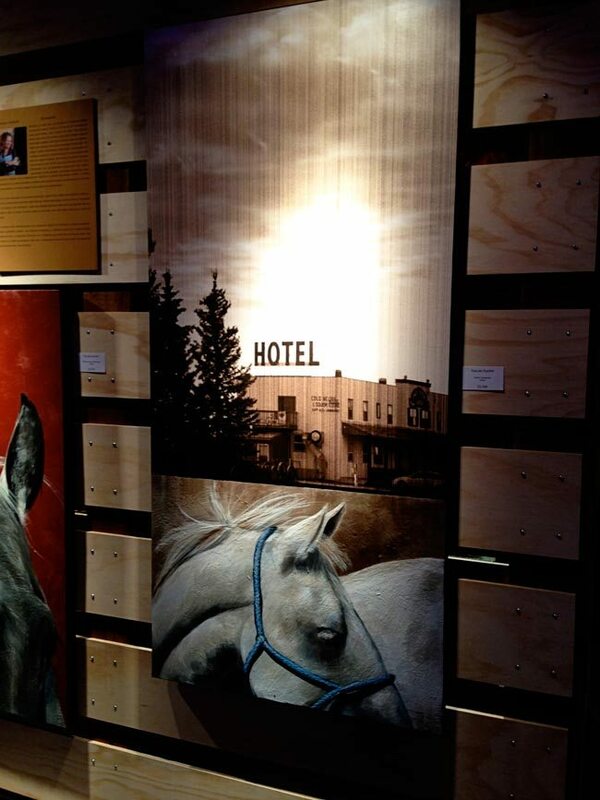 Her work is on exhibit at Calgary’s Leighton Art Centre. Visit her website to check out more of her artwork and her blog on an artist’s life. 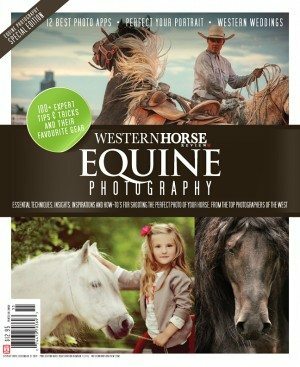 One of the real gratifying perks of my job is the pleasure of meeting the western artists and artisans whose work I’ve admired from afar, as over the years, we’ve structured the content of the magazine to include more of a cultural bend and showcase the vibe of art and crafts in the western world. Consequently, the scope of my Christmas shopping list takes a considerable dabble into this, and we’re all the better for it, supporting our local economy, leaving a gentler footprint on the world, and often gifting pieces bound to become family treasures in the generations to come. Here’s a few the interesting paths we’ve wandered down lately. 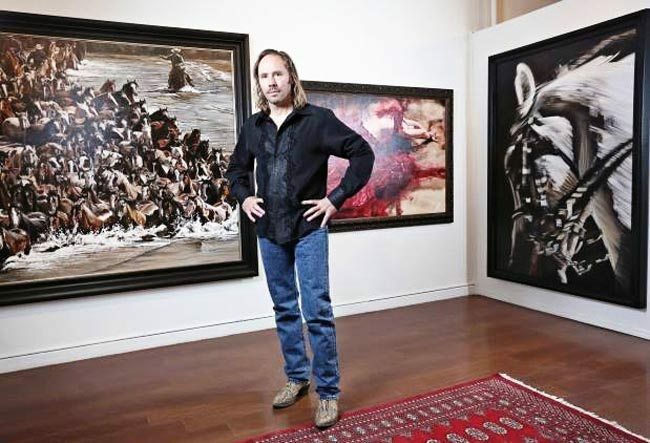 Though the Calgary floods temporarily closed The Van Ginkel Art Gallery – housed in one of the oldest buildings in historic Inglewood – the work of artist, Paul Van Ginkel can again be viewed in all of it’s breathtaking beauty, now that the gallery is open again. See Paul’s Facebook page for a glimpse of what he’s been working on (horses! ), and while you’re visiting be sure to purchase one of his calendars, illustrated with his work. Only $20 and 100% of the donations go to Calgary based charity HOPEthiopia (www.hopethiopia.com). The Van Ginkel Art Gallery has limited hours, be sure to check before you go. 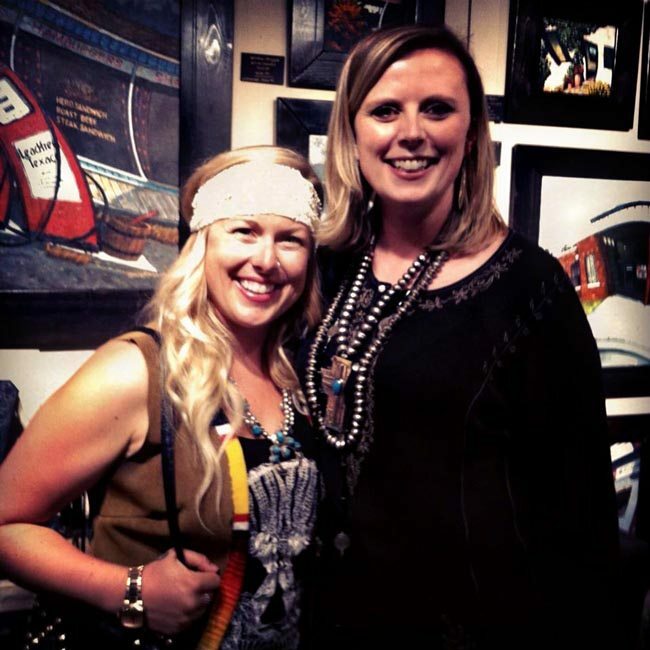 Nanton, Alberta, western artist, Shannon Lawlor has a great Christmas idea – custom hand painted brands. Here’s a collage of several brands shown here on different colours of hide. 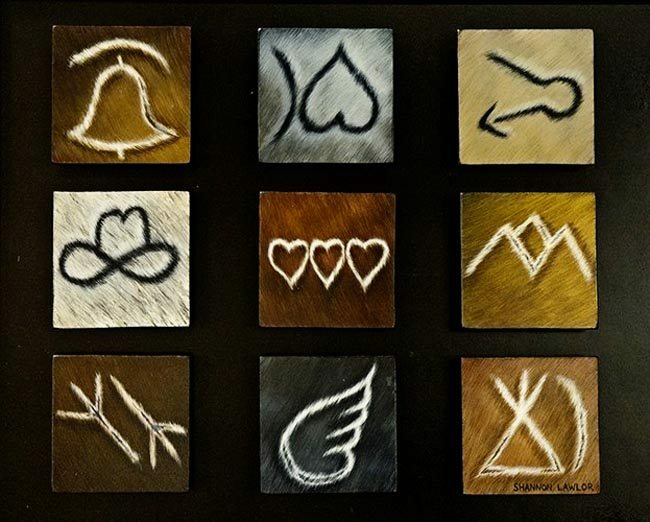 Hand painted on 4″ x 4″ squares, they make a unique gift idea for those with brands of their own. Artist Gena LaCoste brings the Living West to life through her watercolors – horses, cowboys and cowgirls, flowers and heifers, and other gorgeously interpreted western expressions. 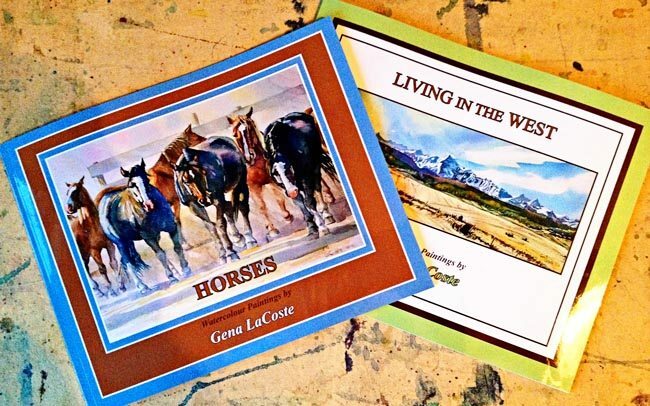 For your little ones, she’s reprinted her books, “Horses” and “Living in the West” just in time for Christmas giving. They are full colour, about 40 pages, 8 x 10 inch soft-cover books, brimming from cover to cover with Gena’s beautiful paintings. 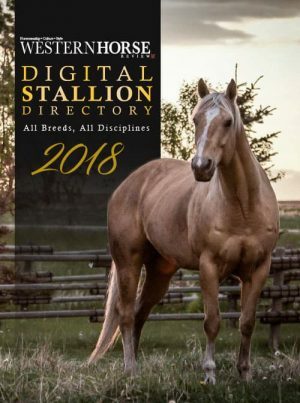 A perennial favourite in the Western Horse Review offices, western photographer Kim Taylor’s 2014 day planner is just as perfect as every year preceding it. I’ve a stack of these in my office, and often find myself flipping back to find a date or notation I need from a previous year. 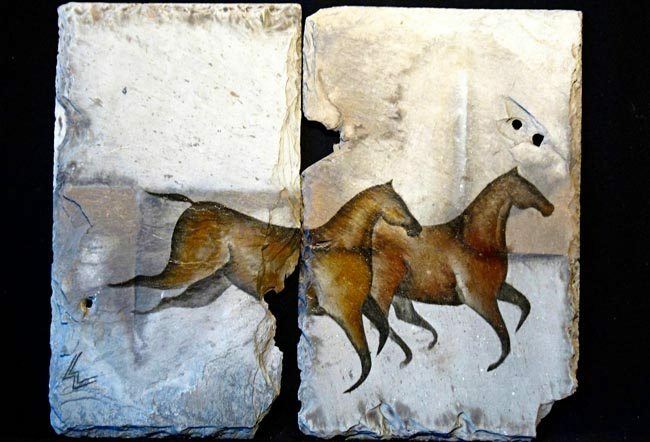 Wanda Whaley’s beautiful slate paintings continue to awe me. 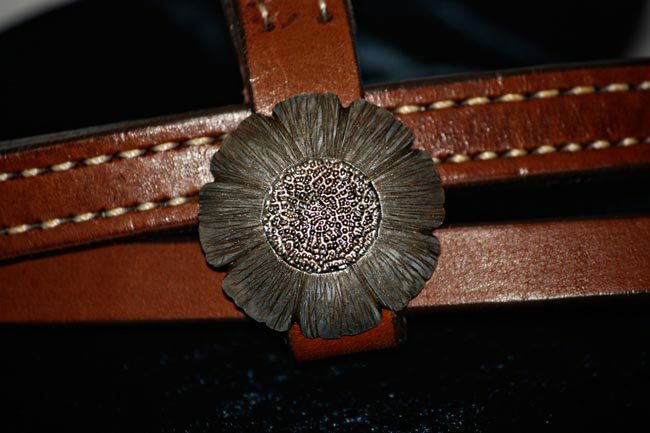 She also paints on buffalo hide, birch bark and clay, working with organic hand-made paints. It’s about as close to 50,000 years ago as art can be. Check out her new work here. 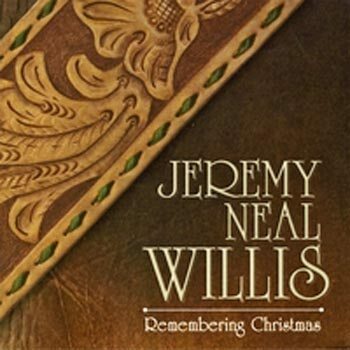 Finally, add a little western Christmas music to your day, with the Jeremy Neal Willis CD, Remembering Christmas, available at the Horse Barn in Kamloops, B.C., and Cowboys Choice in Vernon, B.C., or on cdbaby. Postscript: Thanks to everyone who participated in last week’s 6 Weeks to Christmas Contest. 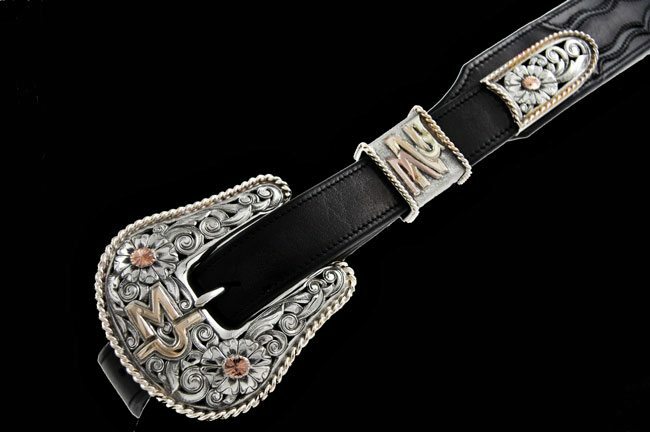 We have a winner: Missy Merrill-Davies, contact us at advertising@westernhorsereview.com by next Friday to retrieve your beautiful Paige Albrecht hand-crafted cowhide belt. Back home, with a studio window that faces the western hills, Daley draws inspiration from her surroundings on the ranch. Jan Daley is a relative newcomer to the business of being an artisan, with her Juniper Creek sign hanging just a scant two years. Yet the craft didn’t emerge as an epiphany of middle age, but more like a coming of age for a long-harboured passion. 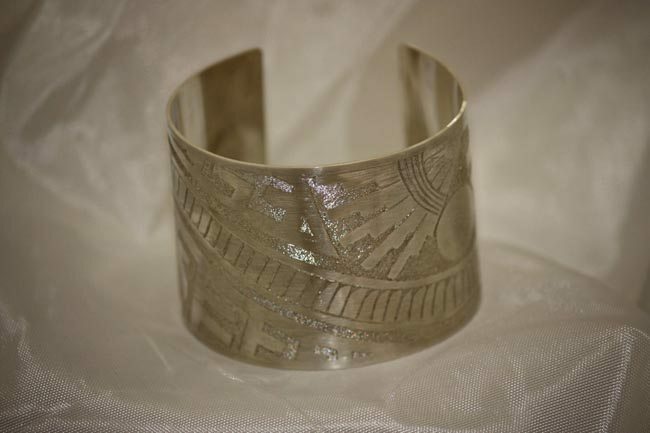 A freehand native etch wrist cuff. 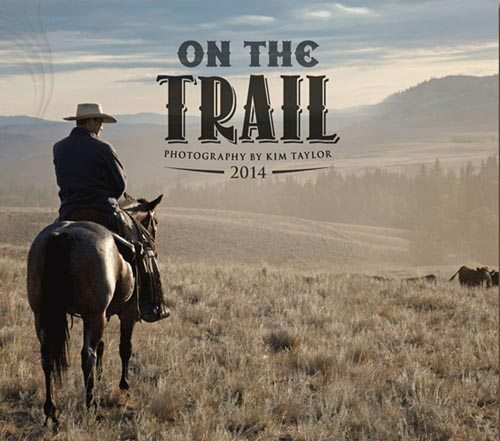 Jan and her husband Mark Daley are deeply immersed in the ranching community. 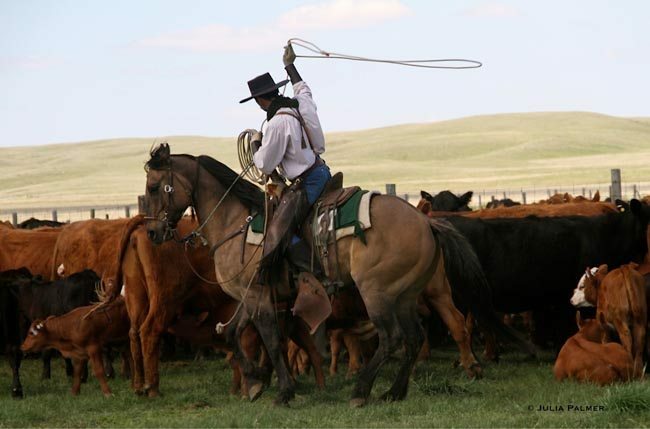 If you were to drive into the foothills of Southwestern Alberta west of Granum and into their ranch, you would most likely find her helping out on the family ranch or in the practice pen working her cutting horse. 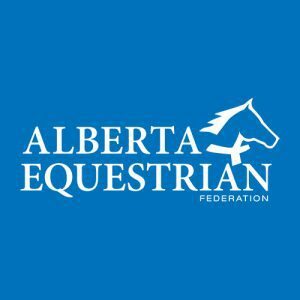 Her father, Kerm Stav, was the first cutting horse champion of Canada and she’s carried on the torch, with a fierce competitive edge in the same sport. 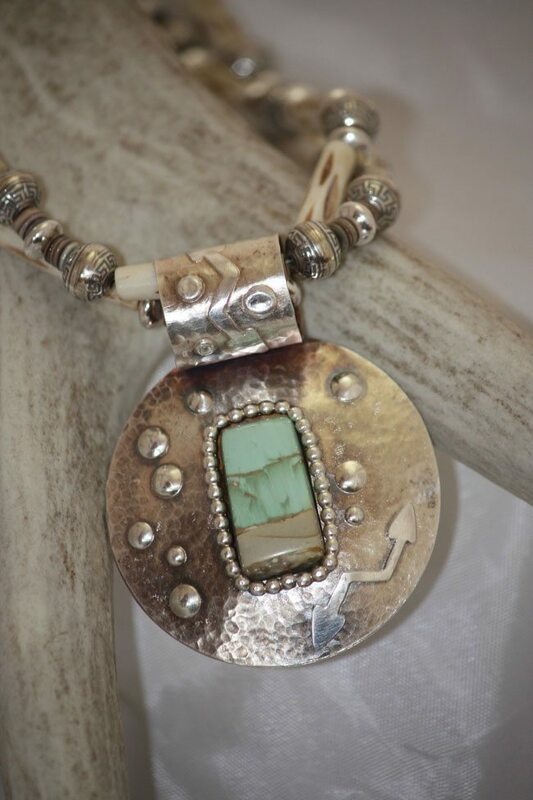 Combining silver with such natural elements as stone, wood, bone and horsehair she creates pieces that compliment both contemporary and western lifestyles. Back home, with a studio window that faces the western hills, Daley draws inspiration from her surroundings on the ranch. 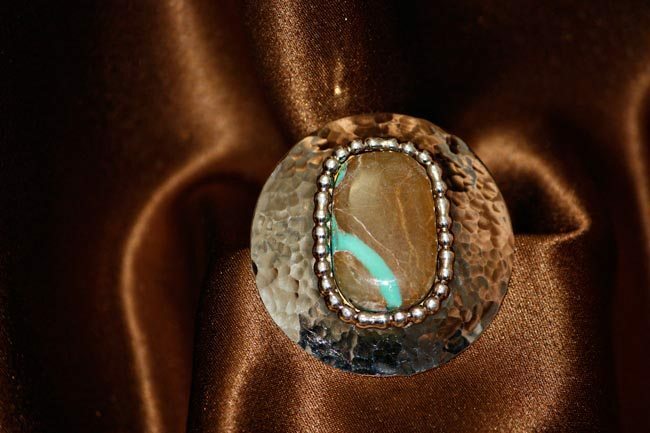 Combining silver with such natural elements as stone, wood, bone and horsehair she creates pieces that compliment both contemporary and western lifestyles. 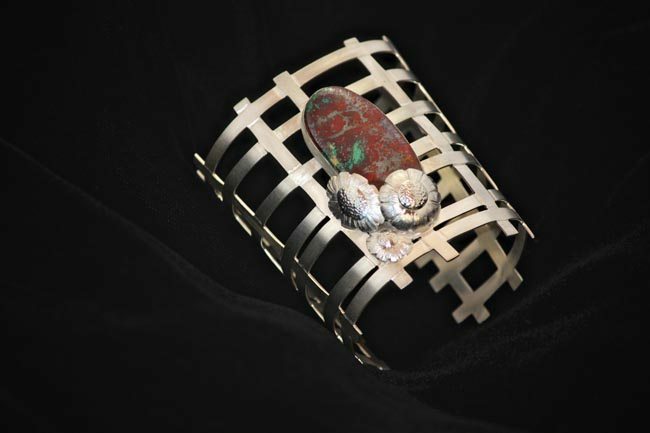 Camelite lattice garden wrist cuff. 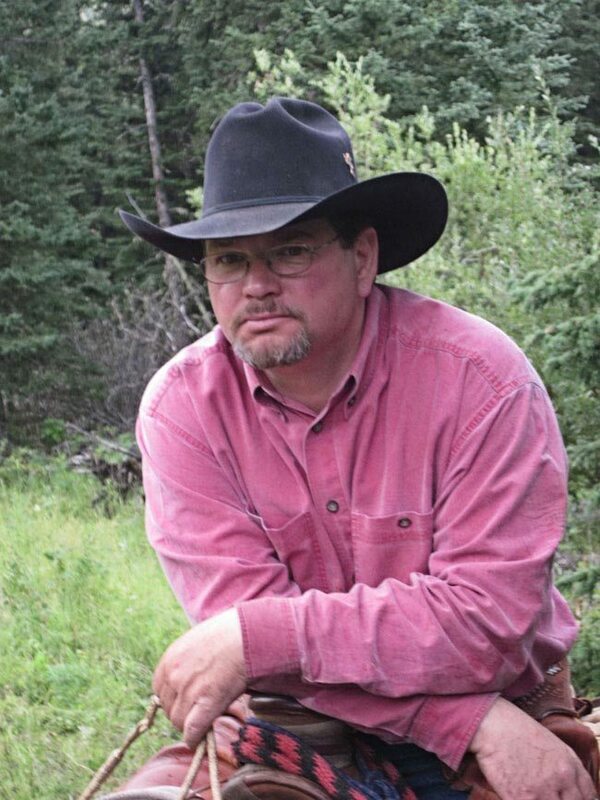 A ranch gal for all of her life she carries a strong opinion on what western culture means. See more of Jan Daley’s work at Juniper Creek. There you have it, three talented western artists. 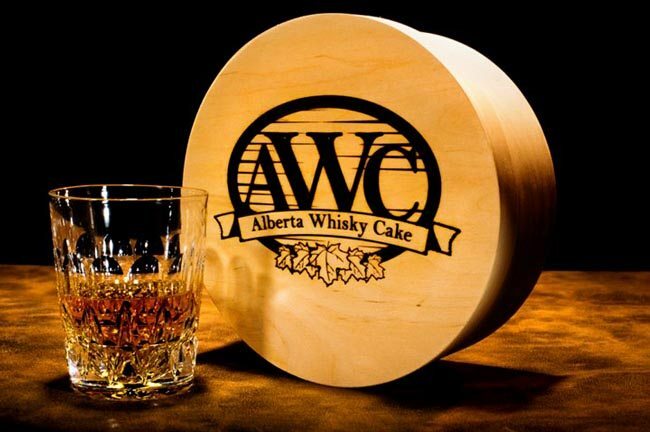 Vote for your favorite in the comment section below and be entered to win an Alberta Whisky Cake! It was pure heavy horse love last night at the Calgary Stampede’s Showcase Stir-up night. Adeline Halvorson’s original artwork, unveiled during the special invite night, depicts a beautiful and kind-eyed gentle giant. 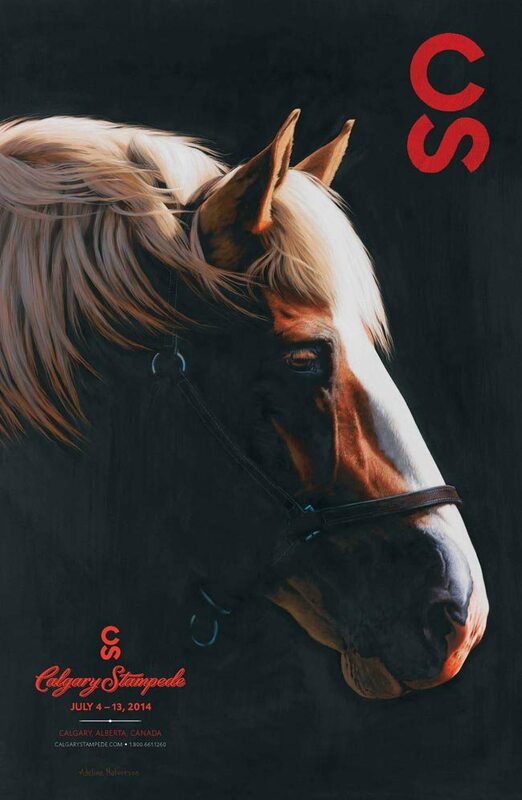 There have been few Calgary Stampede posters in the 101 year history of the Show as singular in theme. I thought Halvorson’s vision of the working horse for the poster, representing a noble animal at the heart of our western heritage, was both unique and brave. While we walked across the Stampede grounds on our way to the Western Art Show, signs of the recent flooding were, of course, still everywhere. 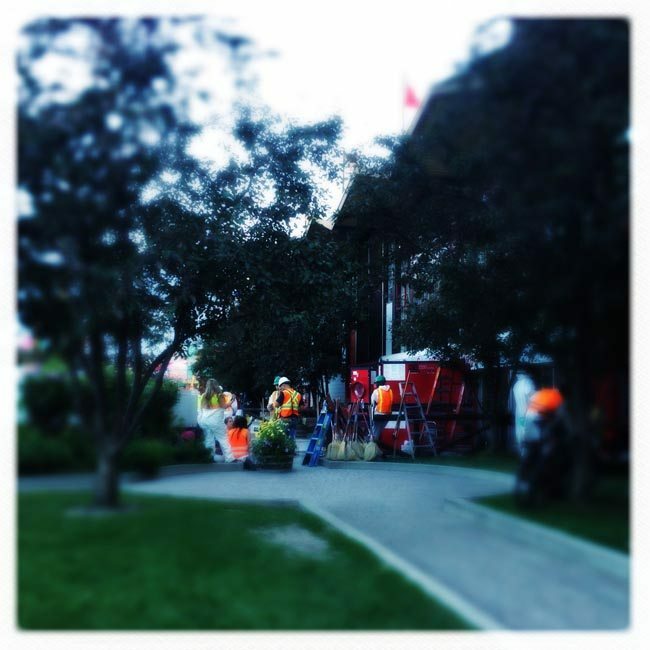 Cleanup, most notably at the Big Four building, seemed to be taking place on a large-scale basis. 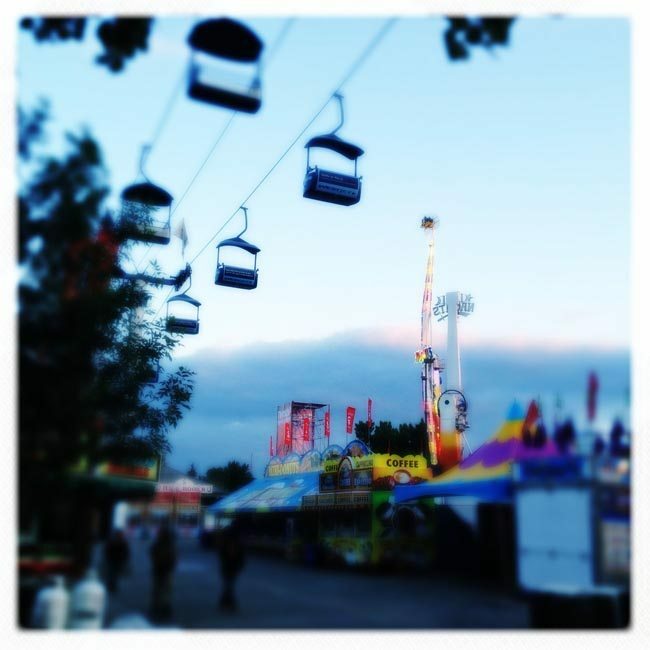 Still, under the glow of city lights, and the buzz of the clean-up crews and equipment, signs that the show will go on as planned, were abundantly evident. 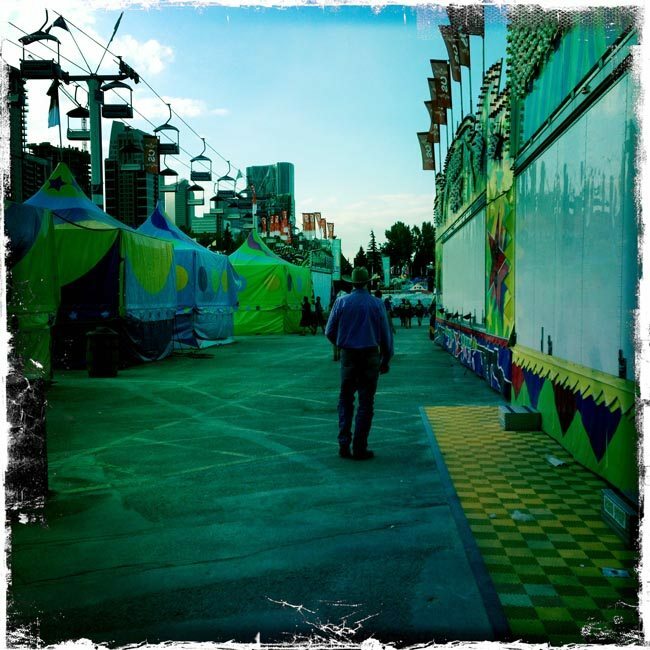 And the Midway appeared nearly ready to greet the first of its fans for tonight’s traditional Sneak-A-Peak night. At the Western Art Show, it was great to catch up and chat with a couple of Western Horse Review’s Artisans of the West, including Shawna Whiteside and Shelagh Blatz, two super talented ladies showcasing their work at this year’s event. I also had the chance to finally meet Doug Levitt, incredibly talented artist and storyteller as it turns out! 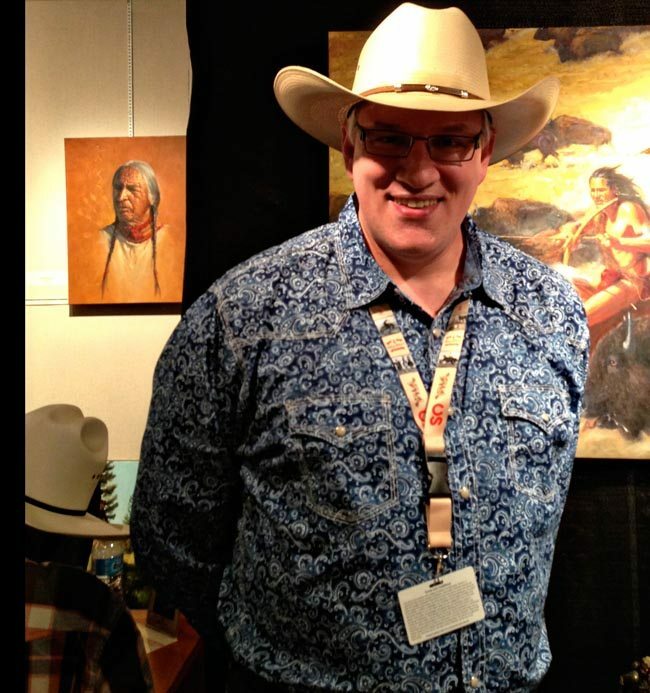 This year, Doug was selected by the Calgary Stampede Western Art Auction Committee as the 2013 Outstanding Artistic Achievement Award Recipient, so meeting him was a special honor for me. 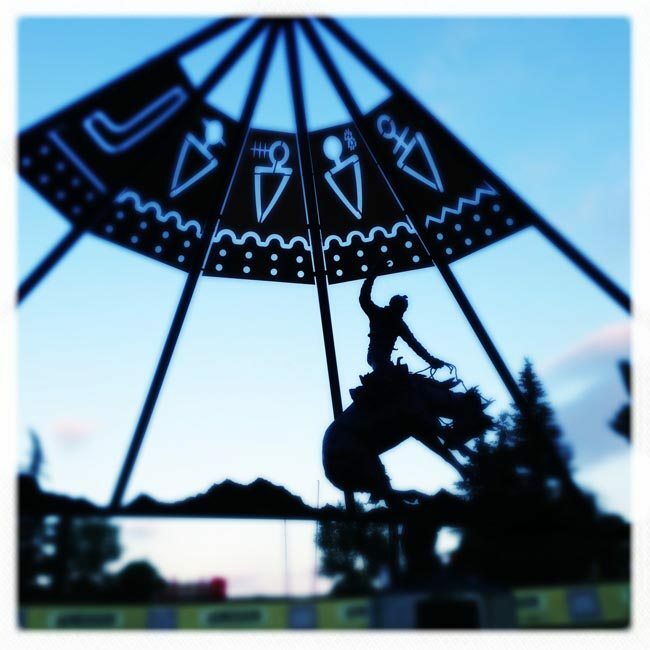 One of Doug’s original pieces of artwork, (see it at this link), is up for Grand Prize of our Embrace Your West Photo Contest, the deadline of which (July 12) will soon be upon us, so enter your photo soon, if you haven’t already! 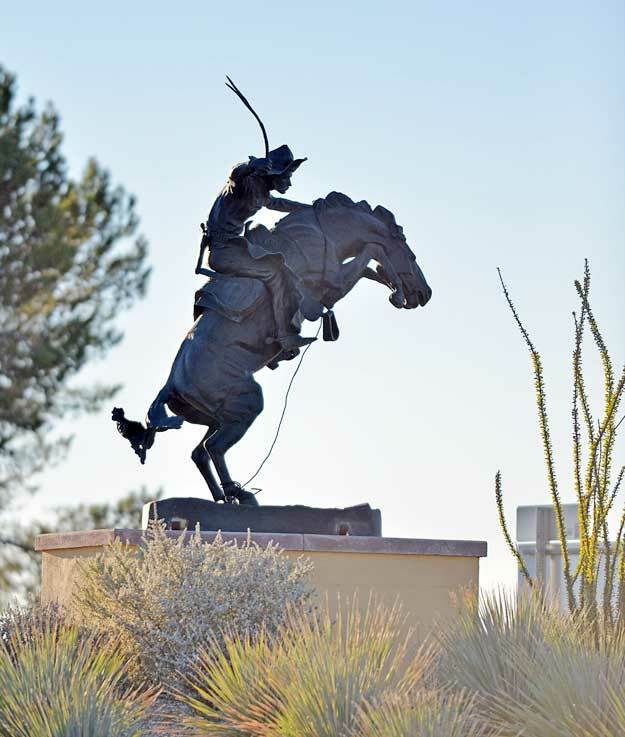 We enjoyed browsing through all of the pieces of Western Art Show, including two from our July/August issue featured artist – Karen Coe. 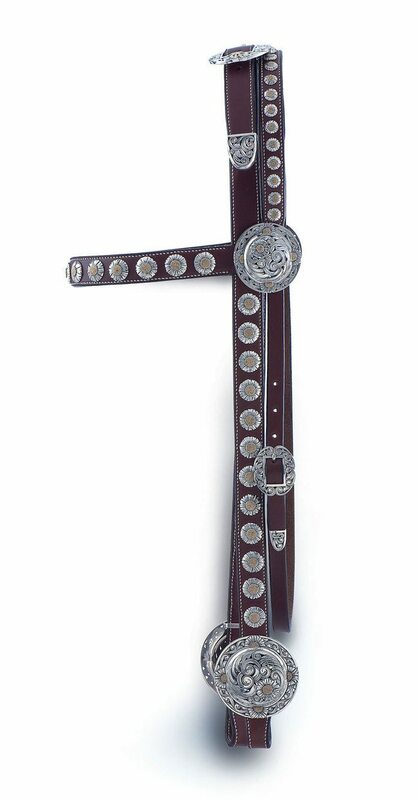 The various Artist Ranch Project’s also caught my eye, such talent and different takes on the subject of western heritage. And, so many pieces which would showcase beautifully at the log house. Sigh. 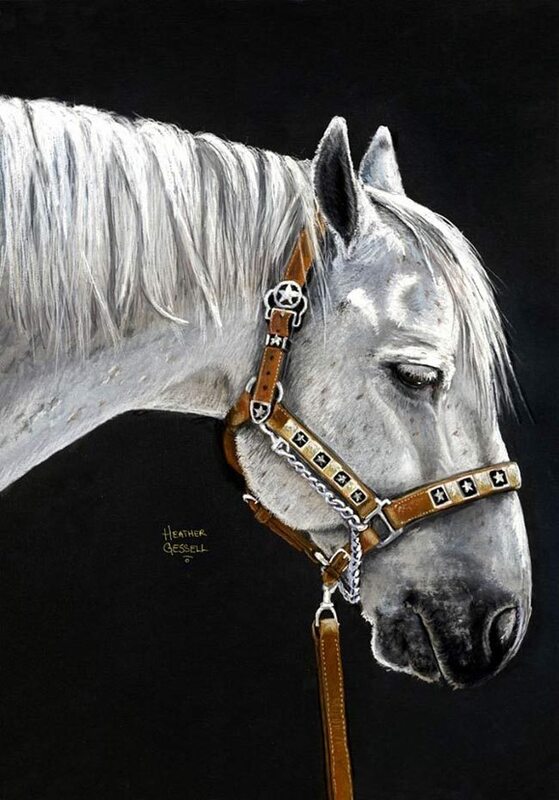 If you’d like to see it in person, Halvorson’s original artwork will be on display at the Western Oasis until it is sold next Thursday, July 11, during the Western Art Auction, which begins at 6:00 p.m. in the Palomino Room. 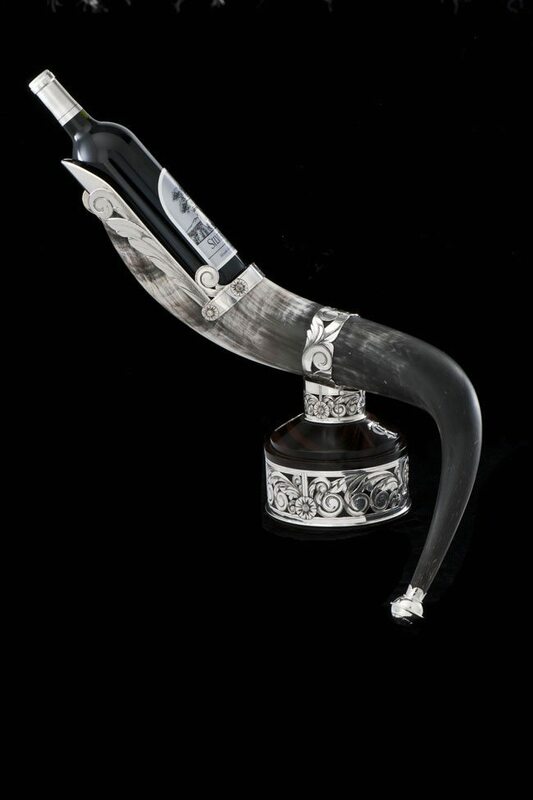 Tickets for the auction can be purchased from the Western Art Sales Desk located in the Western Oasis, BMO Centre. 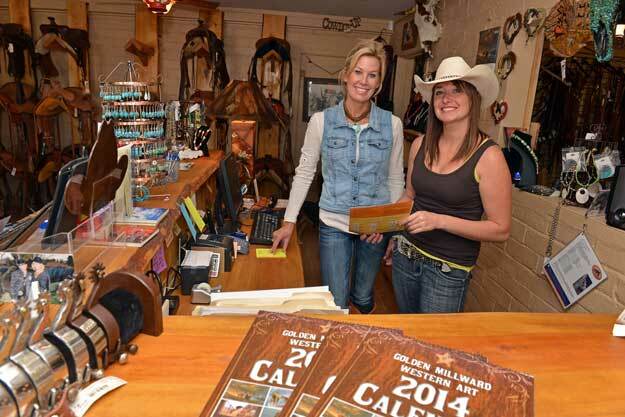 If you're Ponoka-bound for the 77th edition of the Ponoka Stampede next week, you might want to take a bit of collectible memorabilia home with you. 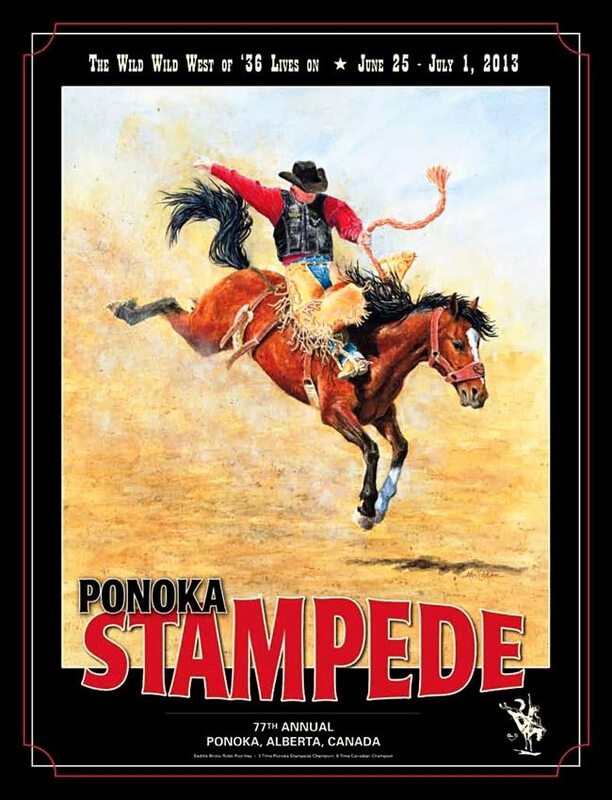 Kicking off a series of original paintings depicting a significant person or event in Ponoka's rich rodeo history, the 77th year poster features World Class Saddle Bronc Rider Rod Hay. 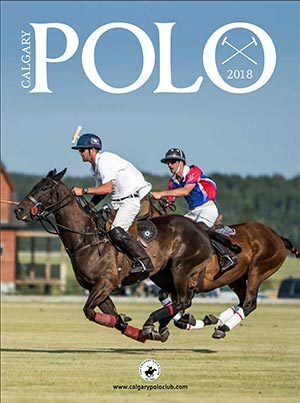 Among too many accolades to mention, (he captured the Ponoka Stampede Saddle Bronc Riding Championship title three times) his natural riding ability and classy style is considered to be a defining career achievement by rodeo cowboys and fans alike. 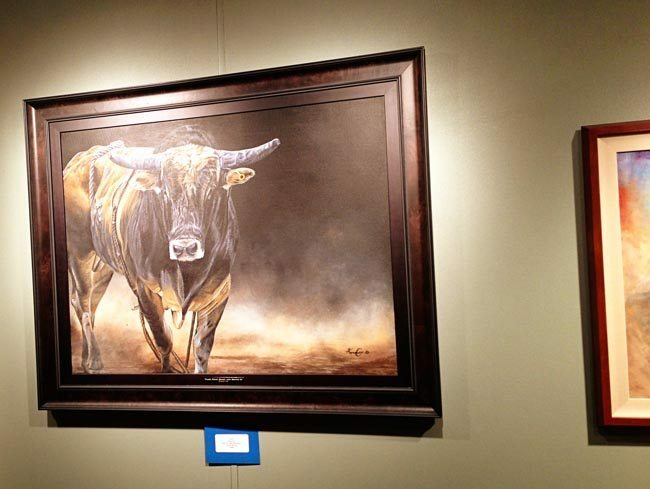 Rod Hay's effortless-looking style is skillfully portrayed in watercolor by artist and rodeo entertainer Ash Cooper. 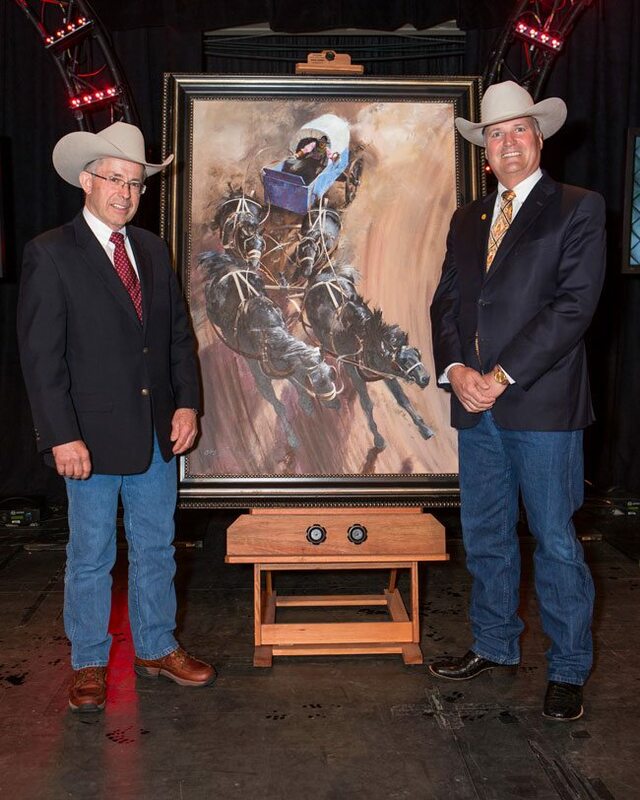 These two cowboys have shared the rodeo arena spotlight for many years and Ash Coopers' first hand knowledge culminated into a true to life painting of the famous rodeo athlete. 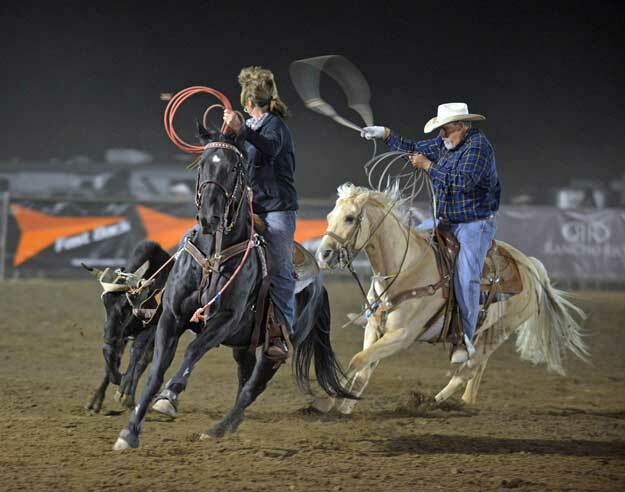 Saddle bronc riding is often described as a true art form and through his paint brush Ash Cooper has captured the action. This year there are 77 limited edition high-quality artist prints available for purchase, each individually signed by Ash Cooper and Rod Hay. 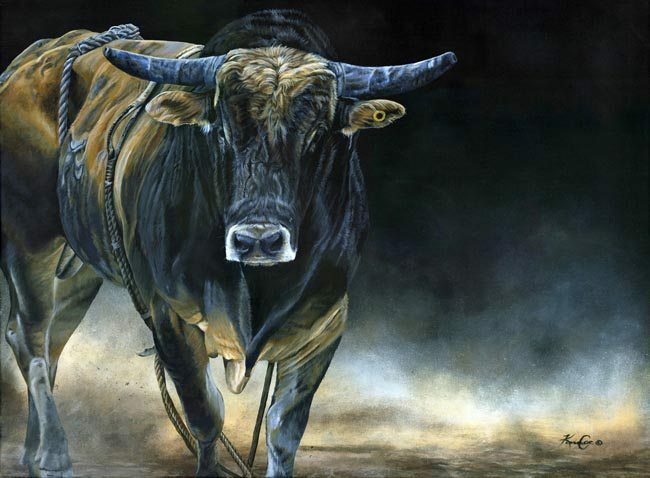 These highly collectable poster sized prints give rodeo fans a once in a lifetime opportunity to seize a single moment where rodeo, art and history intertwine. A portion of the proceeds from the sale of these prints are donated to the Tom Butterfield Creating Cowboys Scholarship Fund. The original painting will be made available for viewing during Stampede week at the Canadian Professional Rodeo Hall of Fame and the Ponoka Stampede Western Art and Gift Show and will be sold with the artist present at the 3rd Annual Ponoka Stampede Live Art Auction set for June 30th at 4 pm in the Stagecoach Saloon.